As someone who appreciates personal growth and renewal so much that I made a career helping others with it, I get quite excited to invest in the idea of a new year with new potential. At the same time, I have recognized for a long time that New Year’s resolutions often undermine our true potential. Our resolutions become a pit of collective failed expectations. Allow me to share a little background before coming back to the New Year’s thing. As most of you know, I recently had a baby. My third baby, to be exact. I have routinely told people throughout my pregnancy and after childbirth that this is my last one. Some people laugh, others seem surprised that I volunteer this information as it can be a bit taboo to discuss these things, though I am not sure why… and some have even awkwardly insisted it isn’t my last. Regardless of any subsequent reaction, I keep saying it, because it’s my truth. It’s a part of my story right now. It means that though my pregnancy was tough, I tried to remind myself to appreciate the little moments of baby kicks and hiccups. It means that even though I have laundry and dinners and a business to check in with, I still grab a few extra moments of baby snuggles. It is also something that makes me happy. Pregnancy is hard, and sleep in three hour intervals is hard, and I take solace in the fact that this is the last time I will subject myself to these life situations. When people see the relief on my face that says I take comfort in the fact that this is my last baby, I think it makes them a little uncomfortable – because you know…babies; and who wants to say that they are glad to be done with babies. Some take it as a sign that I am not grateful for my blessings, while I think others simply don’t know how to respond. But for me, saying it out loud to others is a respectful acknowledgement of my own limitations. It feels good to validate my personal truth even if people don’t get it. I have recently had other women share openly about their own limitations. I asked one friend if she was having more children, and she confidently said, “I don’t think my marriage can handle another baby.” My friend has a great marriage. Sure it has its imperfections, but it is healthy. Still, she comfortably recognized her truth. It was refreshing and I was glad she shared with me. Another friend told me that, while she always thought she would have more children, after a bout of postpartum depression she decided otherwise. She, too, was comfortable with her choice. She elaborated on the depths of her experience and subsequent decision, and it was beautiful. Both of these women are thriving right now. So here is where I come back to the New Year’s thing. 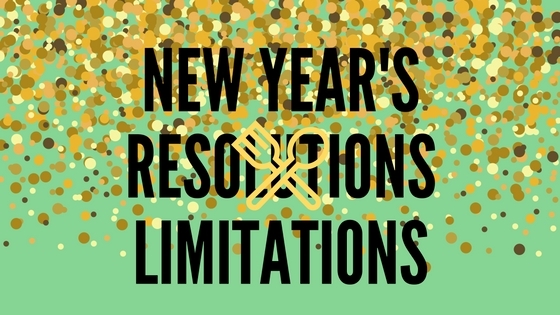 As you contemplate your personal growth and set some goals for the new year, I want for you to also consider your limitations. Get comfortable with them. They are the real truths of our imperfections. I believe a healthy understanding and respect for our limitations takes us to a place where we can thrive. In my life, when I have reached for things beyond my own personal capacity, I’ve ended up in exhaustion and fighting feelings of inadequacy. Personal growth doesn’t live in those places. Many of the women I talk with tell me of their ongoing exhaustion while struggling to be all the things to all the people. If there is one thing I could give them, it is the understanding that they are still wonderful in their real and limited capacity. I want my kids to know that they are not most successful when they take themselves to the brink of ruin by achieving things outside a healthy balance, but rather they are most successful when they can value themselves inside of their imperfection and the boundaries of their limitations. Despite societies cues that we get bonus points for being all the things, it is simply not true. All we get is fatigue and a request to do more. This new year, ask yourself where you have room for growth within your own limitations. Perhaps this year, your growth is getting comfortable with a more realistic capacity. If we can get comfortable with saying we have limits on babies, we can get comfortable saying we can’t take good care of ourselves while being all the things to all the people. What if 2017 holds a goal to do less, in order to invest more in self-care? Maybe for some of you, this year holds the recognition that it’s simply not a year for self-improvement because you are coping with some tough things life threw your way. I guess what I really want to say is that no matter where you are this year in your capacity, I simply want you to respect that capacity. Asking too much of yourself is a sure way to fall short of your goals. Be kind and respectful to yourself when considering your New Year’s Resolutions and maybe, just maybe, 2017 won’t go into the pit of collective failed expectations. Here’s to you and your year of loving your limited self.